Whatever fuel you use in your stove it will last longer than in an open fire. A stove, with its enclosed flue will prevent draughts and burn three times hotter than a simple fireplace. 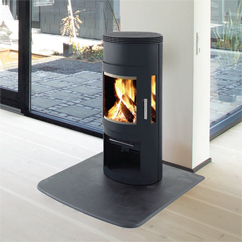 Most wood burning stoves will be able to burn peat, straw, wood waste (coarse saw dust/chippings) and compressed paper, these are all dry and will burn at a very hot temperature. You should check either in the manual or with the supplier what fuels are suitable. Other fuels can be mixed with logs but be sure not to overfill the stove.